Entertainer Jerry Seinfeld recently stated in an interview that “I think, on a very drawn out scale, I think I’m on the spectrum”. And from this was spawned a small faux controversy which, if anything, exposes the problems we face as a community due to a lack of understanding and unity from my own fellow autism parents. If you wonder what I mean by that, parents of kids with the more obvious challenges presented by autism (children like mine, for example) are sometimes wont to get very defensive should autism stories be framed around anything other than the challenges faced by us as parents and by our kids. It’s not a position I take and, in fact, it is a position that causes our communities a great deal of harm. You’re never paying attention to the right things. Basic social engagement is really a struggle. I’m very literal. When People talk to me, and they use expressions, sometimes I don’t know what they are saying. But, I don’t see it as dysfunctional. I see think of it as an alternate mindset. For anyone who has followed the online parent discussion, it isn’t surprising that these statements would cause a backlash. What was surprising was that this story got legs, as they say. The Chicago Sun Times has Jerry Seinfeld’s ‘celebrity autism’ doesn’t help, by autism parent Marie Myung-Ok. The Washington Post has For some parents of autistic children, Jerry Seinfeld’s self-diagnosis was ‘a slap in the face’. This article starts by quoting a writer from the Age of Autism blog (Kim Stagliano), and also quotes the Sun Times article above. Buried in the middle is some reason by John Robison. What I fear is that these public faces of autism will allow society, and more important, policymakers, mentally off the hook. You can have autism and get a Ph.D.! It helps you write jokes! Your charming quirks and aggravating behaviors are now explainable. Here’s the thing. One can have autism and get a Ph.D.. And I that’s not speculation on my part. In 20 years since I received my Ph.D. (and the years getting my Ph.D.), I’ve met a few. Let’s take Ms. Myung-Ok’s example: Temple Grandin. There’s someone who has overcome some very significant challenges to get to where she is today. Do we discount those challenges, both the ones she faced growing up and the ones she faces now, because she has a Ph.D.? Does the DSM say anywhere, “Except for people who go to college”? No. What about Ms. Stagliano, quoted in the Washington Post? What sent her into a “rage spiral”? Here’s a point of fact that both Ms. Stagliano and Ms. Myung-Ok need to accept: one can be autistic and successful. And that in no way diminishes the challenges faced by autistics–both those few who achieve success and the many who do not. Here’s how you keep stories of autistic adults from becoming one-dimensional stories of successful autistic people: You don’t try to shout down the discussion; you call for a more in-depth discussion. Let’s take Mr. Seinfeld’s recent interview as an example. Recall that it wasn’t about autism. It was about his web series Comedians in Cars Getting Coffee. So there wasn’t a lot of space for an in-depth discussion of why he came to the conclusions he did or what he really means by his statements. Note that he didn’t say he’s autistic, he said, “I think, on a very drawn out scale, I think I’m on the spectrum”. 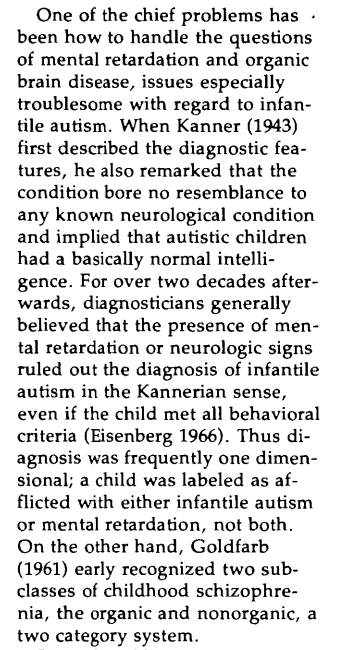 That sounds to me more like broader autism phenotype (autistic traits but not enough to warrant an autism diagnosis). Wouldn’t it be great if instead of going into a “rage spiral” we got more information on what Mr. Seinfeld feels puts him somewhere on a “very drawn out” part of the spectrum? Much more, given his success, wouldn’t it be great if we could find out what he did to make those traits not dysfunctional for him? Perhaps we could learn a thing or two to help others in our community. Probably not my kid or Ms. Myung-Ok’s kid or Ms. Stagliano’s kids. You know what, some of the coping skills of other student’s in my kid’s school don’t help him either, even though they have very significant challenges. But, even if these coping skills don’t help our kids, all of autism is our community. Not just the parts that Ms. Stagliano and Ms. Myong-Ok want. Once one got Mr. Seinfeld into this hypothetical in-depth interview, wouldn’t it be helpful if Mr. Seinfeld could talk about the disabling aspects of autism? To talk about the entire spectrum? Wouldn’t that help us all? Being a parent of a child with severe autism in no way diminishes my respect and admiration for Jerry Seinfeld and others striving for autism acceptance. What I am proposing is separating the high-functioning end of the spectrum — perhaps calling it something else — so that we can focus on the urgent and looming issue at hand. There are many things wrong in that short paragraph. First–it is the most disabled in our community (both disabled adults and children) who need autism acceptance, and it should be those of us who care for them who should be calling for this. We need our children, our siblings to have the respect and dignity afforded to all people. We need this to protect them from abuse and so that society will provide the supports we are calling for. Second, there are many “urgent and looming” issues. Not one. The needs of those with the most obvious challenges are diverse. But the needs of those in the “high functioning end of the spectrum” are great and real. Or, once again, “urgent and looming”. John Elder Robison put it much better than I at a recent IACC meeting. Earlier in that meeting we heard about the medical issues which are more prevalent in the autistic adult population, including a much higher rate of attempted suicide. I’d say to the person who just suggested how much worse her own child was, the sad truth is my end of the spectrum where most autistic people kill themselves. I have lived with enough complications myself that I know the pain of this is very real everywhere on the spectrum and think frankly all of us are equally deserving of respect and recognition that our problems as autistic people are legetimate and real and all we should pull together to help, not fighting. Lastly, let’s consider this question of whether to split the spectrum. It goes against decades of understanding of what autism is–a spectrum. This was demonstrated in the way that Asperger syndrome was acknowledged as a part of the autism spectrum. Here’s one way to look at this: Just as I wouldn’t consider a general severely handicapped classroom appropriate for my kid (even though those kids have extraordinary needs), the supports (even if they are self-generated supports) needed by someone like, say, John Elder Robison are different from the supports I need (and, face it, we all need supports of some sort). It’s autism, not intellectual ability that is the defining factor. And we need to learn from each other and support each other. As to the question of separating the autism spectrum, let’s consider the historical perception of autism. I suspect Ms. Myung-Ok is not aware that in, say, the 1950’s many kids whom she refers to as “severely autistic” would not be given the diagnosis at all. For those who have been saying that autism is “defined by and diagnosed by behaviors” (an argument I’ve seen a lot in online parent discussions of how Mr. Seinfeld is not autistic). That’s not really accurate. Autism papers often have discussions of individuals where they need an expert opinion to make the final diagnosis. In other words, even though the individual may have scored on some test in the autism range, there’s more to the diagnosis than just a checklist. Just because someone doesn’t show obvious behaviors of autism doesn’t mean someone is not autistic. Readers here will likely recognize that I don’t spend much time in speculating on whether historical or public figures are/were autistic. I’ll break that for the moment with Mr. Seinfeld. Do I think he’s autistic? Not given the scant information available to us. Much more importantly, did he said he’s autistic? As I noted above, it sounds like he’s saying he’s broader autism phenotype. And, perhaps if we let him expand on his thoughts rather than shouting him down we as a community could benefit. ← Final Reminder: 2014 IACC Call for Nominations Closes Friday, November 14, 2014! Thank you for that much needed response. Thank for your excellent, well-reasoned response. It was much needed. When I posted comments on the Washington Post article, I noted that Ms. Stagliano had already posted one of the two ranting articles which appeared on Age of Autism. Shortly thereafter, three additional articles appeared on that blog, which totally misrepresented Jerry Seinfeld’s statement. The Washington Post really messed up by proving Ms. Stagliano a platform for her ill-informed divisive statements about ASDs. Looking at this 1981 article,one can see that the debate over what is or isn’t autism,has taken a complete 180 degree turn in the intervening years,to where we are now talking about whether the very high functioning belong on the spectrum or not.I sort of thought the DSM-V had made the first steps in splitting the spectrum,as you say,by creating the new classification of Social Anxiety Disorder. I think what Mr. Robison may be talking about when he mentions suicide,is the fact that many very high functioning people on the spectrum,have coexisting psychiatric disorders,such as bipolar disorder,or clinical depression,and that these conditions are often more severe than the autism itself.Do these people have autism,or do they have bipolar disorder or depression with autistic features?This argument works just as well anywhere on the spectrum. I really think we need to reevaluate the entire notion of whether autism should exist as a clinical entity,all across the spectrum.Are the behaviors we diagnose as autism,is merely a feature of many different disorders that can effect the brain,much the way seizures are another feature?Science of the brain,and of the immune system,and of metabolism and mitochondria,and the way they interact with the brain,has advanced greatly since the days of Kanner and Asperger. Suicide attempts are much more common in adult autistics than in adult non autistics. I believe he was reasoning that those in more restrictive environments are less likely to have the opportunity to attempt suicide. I actually didn’t say that the DSM 5 made a step towards splitting the spectrum. In fact I commented that the DSM 5 made a step towards inclusion within the spectrum by eliminating sub categories. Instead of PDD-NOS and Asperger Syndrome and autistic disorder, we just have autism. Jerry Seinfeld has stated (see Time magazine) that he is NOT on the Spectrum. His remark about autism as just ” a different way of thinking” were heard round the world though. You are, once again, eager to demonize other parents of autistic children advocating on behalf of their children. Autism categories have fluctuated over time and will continue to do so. What will not change though is the dominant media AND researcher tendency to ignore the existence of those with severe autism and ID. The trend in research has been recognized even by C. Lord. The media generally loves to portray autism as genius or high intellect with extreme shyness and obsessive behaviors. Few even blogger/parents like yourself who should know better take time to mention that autism is a diagnosis the criteria for which require in Criterion D: Symptoms cause clinically significant impairment in social, occupational, or other important areas of current functioning. The DSM5 now distinguishes severity levels. NO ONE including Jerry Seinfeld, a great comic talent, or Matthew Carey … a blogger should portray autism as just “another way of thinking” For those at the severe end of the spectrum it is much, much more serious than that and you should know that and stop fighting parents who are the only true advocates for their severely autistic children. You do a great disservice to the parents and their severely autistic children. First and foremost: our children are not our shields. Just because someone has a severely disabled child that does not allow them to say anything without criticism. As you just demonstrated above in your critique of me. I do not the double standard, wherein you, Ms. Stagliano and Ms. Myong-Ok are immune from criticism due to their children but I and others who disagree with you are not. There is no “demonization” above and none in criticizing the divisive comments made by Ms. Stagliano and Ms. Myong-Ok. I am not surprised that you joined with the divisive groups in our communities, in fact I expected it. Some research focuses on those autistics without intellectual disability. Some focuses directly upon those with intellectual disability. It is easy and cheap to complain whenever a study focuses on those without ID. It is also easy and cheap to misrepresent what Mr. Seinfeld said. He didn’t say he was autistic. Apparently being correct on that earns one (myself in this case) criticism, while making divisive statements based on a misinterpretation earns one praise from you. I’m comfortable with being correct and inclusive of the entire spectrum. And I will stand up and criticize parents, autistics or others who promote a divisive message. I did not and do not say that autism is “just another way of thinking”. Neither did Jerry Seinfeld. Perhaps you need to watch the interview again. He said that for him, the traits he saw were autism like were another way of thinking. Which begs the question, why did you try to paint me as stating that? If you had just criticism it would be based on facts. Autism is much more serious than you portray for those without intellectual disability. A point which I doubt you will ever acknowledge. I don’t speak much about my family in public. It’s easy to take that and paint me as downplaying the challenges of autistics, both those with ID and those without. Ironic, isn’t it, that your comment came just hours after an article I put up about the extreme challenges faced by adults on the spectrum? Both those with and without ID? Or, an autism and wandering story involving an autistic with ID. Said story was ignored by those who have taken on the wandering issue. Could it be because the gentleman in this case is an adult? Or how people are advocating the killing of fetuses because they are autistic. As the parent of a “severely autistic child” I am quite aware that it is my child who is the first and primary advocate. I am the amplifier. I am also quite aware that in the autism communities, my child’s greatest allies are quite often autistics without intellectual disability. I hope that clears things up for you. I do hope you at least come back and read the response. You clearly do not generally read nor understand what I have to say. While that makes it easy to throw criticism around, it doesn’t accomplish anything. Glad that you read that part of the article above. Could you expand on your comment? Were you aware that your child and my child (and Ms. Staglanio’s children and Ms. Myung-Ok’s child) are do not have “classic” autism in that in the first decades after the diagnosis was coined, our children would not have received autism diagnoses? It’s easy to say, “let’s split the spectrum along some arbitrary and nonscientific line”. But who, then, would be considered autistic? If we were to go by the original understanding, it wouldn’t be our kids. You are aware that success in many therapy studies is taken as increasing IQ to above the ID line, aren’t you? One thing I have advocated for on the IACC is an understanding that this is not a good metric at all. That was a lesson I learned when our family participated in a clinical trial and I saw how the results were presented. Yep. And that isn’t what he said, is it? So that message got heard by a lot of people. And who do we have to thank for that? The press for one. The titles of some of the news stories were wrong. But, let’s not forget Ms. Stagliano, Ms. Myung-Ok and others who took this as an opportunity to get their divisive “real autism is autism with ID” message publicity. Rather than trying to correct the news stories–point out that Mr. Seinfeld didn’t say he was autistic and didn’t say that autism is just a different way of thinking–they amplified the misinformation. true to form, you don’t reply or take part in the conversation. Instead you retreat to twitter and throw taunts. When you want to actually learn about the people you attack, come back and listen. Einstein was noted for occasionally forgetting to wear pants to work. He didn’t really think of himself as particularly intelligent–he said once that he was able to come up with the things he did because he HAD to think about things like time when other people didn’t–that things that were simple to other people weren’t to him. Mozart died in a gutter in his 30’s. I’d say they’re pretty striking examples of how even astonishing and highly-developed talents don’t actually obviate the significant challenges of neurodivergence. A google search on broader autism phenotype (a term that may finally help me, the mother of a child on the autism spectrum, understand myself) brought me here. While the Seinfeld portion of the post is “old news” the issues it raised and subsequent discussions still ring true. Thank you for this thoughtful piece.